I’m sick & tired of people saying wireless is a better alternative to Fibre in regard to the NBN debate in Australia. I have thralled the net looking for some really world results & finally am satisfied with what I have found I’m not after marketing claims or anything like that, I’m not quoting some peace of policy, these are results recorded through the one and the same site, speedtest.net. Below is a video recorded in the US, it compares Verison LTE vs. Sprint 4G. The results are less than impressive, Verizon LTE modem clocked in speeds of 7.40 Mbps down & 1.40 Mbps up while the Sprint 4G 1.76 Mbps down and 0.40 Mbps up. The numbers based on performance speak for themselves. I’ve got myself a new phone & have now done a speedtest on the Telstra NextG / UMTS 850 / US3G network (what ever standard they want to call it), using the USB tethering capability. The results are unsurprising for wireless. 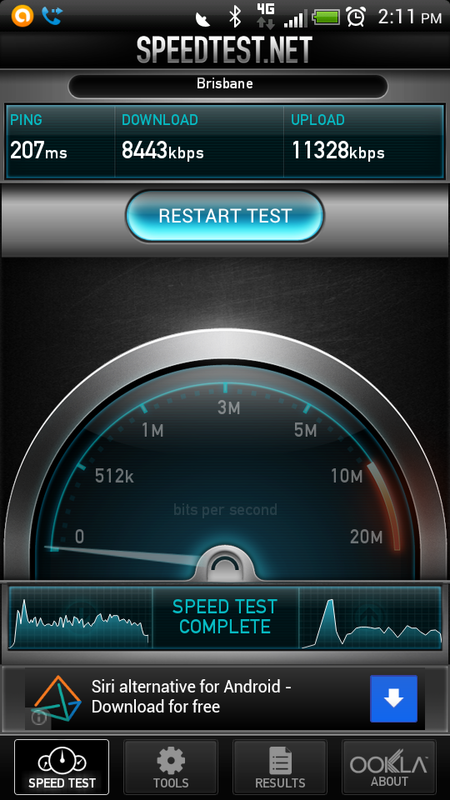 For those who keep wanting to say that 4G is better then Fibre to the Home (FTTH), I think not. This entry was posted in Internet / Online and tagged 4G, Broadband, LTE, National Broadband Network, NBN, NBNCo, NextG, Telstra, UMTS850, US3G, Wireless on February 16, 2011 by JAB_au. After i see the huge difference in it’s network speed, i really cant wait for the new FTTH technology. Something badly wrong with those figures. Having spent 20 years in data comms you cannot get 15 Mb/sec from a 20Mb line nor 92Mb/sec from a 100Mb line. Too many overheads like 20% for controls and addressing in a 1500 byte packet without counting all of the switching delays and clashes and re-transmits and bottlenecks on the servers, etc. Apart from which where are the high spped links to the www. If you get a 50% practical rate you are doing well. Methinks you were probably testing internally on you own network. How about picking up a 500MB file – HP printer drivers are 600+MB (capital for bytes not bits). At your 92Mb per sec – that 9.2MBytes per sec – then you should download in about 70 secs but it will probably be ore like 150secs. If you were familiar with speedtest.net you would know that it’s terminology is incorrect and that it’s results are based on data transfer between the users computer and the many different servers that the user can pick from. The speedtest.net results do have the wrong label for the data speeds. e.g My test results of 15.2 Mbps is based on a DSL line that trains at about 18.5 Mbps this gives me roughly 1500KB/s download rate. Speedtest.net results are based on download rate converted back to line rate. The NBN result is not a test conducted by me, see the link below it, it is a test conducted between the and user connected via iiNet and the Optus speedtest.net server in Melbourne, so this is not a local test. Most fail to see that fibre is complementary to wireless. To achieve better performance to your wireless service, be it mobile broadband or Wi-Fi at home, if the delivery access system is slow, then you will get less from your wireless. Therefore Wireless should not be compred to Fibre, because the point is, they are complemntary to each other! Market people may tell you different!